PRINCE William and Kate Middleton cut the first slice of a magnificent eight-tiered wedding cake on Friday afternoon as they celebrated their marriage. The confectionery masterpiece covered in cream and white icing and decorated with up to 900 delicate sugar-paste flowers was centre-stage at the Buckingham Palace reception. The wedding cake, designed by Fiona Cairns, was accompanied by a chocolate biscuit cake that William had requested made from a royal family recipe. Garland on the cake matched architectural garland in the room, and each of the many varieties of flowers decorating the cake carried a specific meaning. 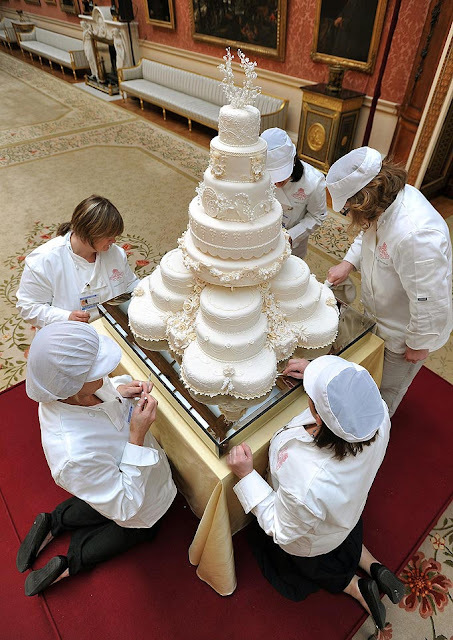 The wedding cake was made up of 17 individual fruitcakes, with 12 forming the base. The cake was then decorated with cream and white icing using the Joseph Lambeth technique. The cake was served at a lavish lunchtime wedding reception at Buckingham Palace for 650 close friends and family. On Wednesday, destructive tornadoes swept through a wide swath of the South, leaving at least 300 people dead and making this is the deadliest tornado outbreak since 1974. The death count rose steadily throughout the day: at least 195 in Alabama, 34 in Tennessee, 32 in Mississippi, 14 in Georgia, 12 in Arkansas, five in Virginia and one in Kentucky. Authorities anticipate the death toll to rise even higher in the next few days. The National Weather Service's Storm Prediction Center in Norman, Okla., said it received 137 tornado reports around the regions into Wednesday night. In Alabama, where as many as a million people were without power, Gov. Robert Bentley said 2,000 National Guard troops had been activated and were helping to search devastated areas for people still missing. He said the National Weather Service and forecasters did a good job of alerting people, but there is only so much that can be done to deal with powerful tornadoes a mile wide. 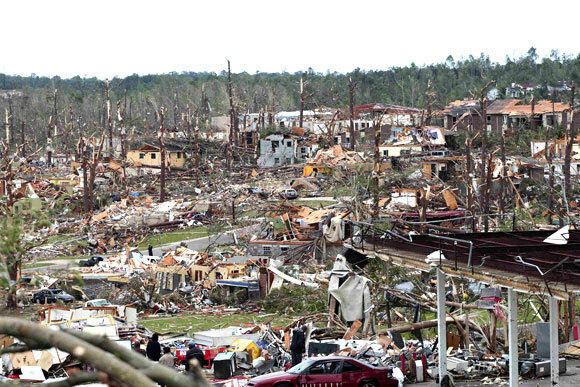 One of the hardest-hit areas was Tuscaloosa, a city of more than 83,000 and home to the University of Alabama. A massive tornado, caught on video by a news camera on a tower, barreled through late Wednesday afternoon, leveling the city. The storm system spread destruction from Texas to New York, where dozens of roads were flooded or washed out. The governors of Alabama, Mississippi and Georgia each issued emergency declarations for parts of their states. President Barack Obama said he had spoken with Bentley and approved his request for emergency federal assistance. The storms came on the heels of another system that killed 10 people in Arkansas and one in Mississippi earlier this week. Gamers who use the Sony PlayStation Network were not able to connect to the service on Monday, the fifth consecutive day of interrupted service, after it was invaded by hackers last week. On Friday, Patrick Seybold, senior director for corporate communications at Sony, wrote a short post on the company’s Web site stating that the PlayStation Network had been compromised on Wednesday by an “external intrusion.” After the attack, Mr. Seybold said, Sony had turned off the PlayStation service to investigate. Sony did not respond to a request for comment about the shutdown and whether any of its customers’ personal information was also compromised. The PlayStation Network connects gamers who use a PlayStation 3 or PlayStation Portable system. The Sony Qriocity service, which is used to stream audio and video to Sony devices, was also compromised in the attack. On Saturday Sony said it had decided to rebuild its network with the goal of strengthening the system’s infrastructure. “Though this task is time-consuming, we decided it was worth the time necessary to provide the system with additional security,” Sony said in a statement. Customers became frustrated over the weekend, complaining on Twitter and Sony gaming forums, as the company’s updates remained short and sporadic and there seemed to be no end in sight to the shutdown. 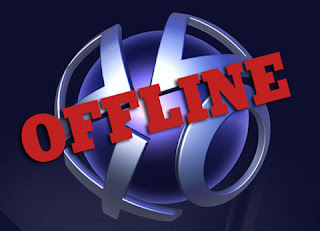 Mr. Seybold wrote a short follow-up post on Monday noting: “Unfortunately, I don’t have an update or timeframe to share at this point in time” regarding when the PlayStation Network would be active again. While there is a great deal of commemorative merchandise for sale to memorialize Prince Charles and Kate Middleton’s wedding next Friday, April 29, at Westminster Abbey, one of the most popular items has been the “Princess Catherine Engagement Doll” by Arklu wearing the same blue dress she wore to announce their engagement. On sale for £35 the limited edition doll by Arklu is very popular with UK online shoppers. According to the internet search monitoring company Experian for the week ending April 16, the term “Kate Middleton Doll” was one of the largest retail related search terms. The Franklin Mint is also selling their own doll-like version of a Kate Middleton, also wearing the blue designer “Issa” dress which Middleton wore at the announcement of her engagement to Prince William in November, 2010. It remains to be seen if any of the dolls will become collectors' items, however the dolls that have been manufactured in the past such as the late Princess Diana doll and the Prince Charles doll are now being sold for up to $1,950 - a piece. The largest fossil spider discovered to date once ensnared prey back in the age of dinosaurs, scientists find. The spider, named Nephila jurassica, was uncovered buried in ancient volcanic ash in Inner Mongolia, China. Tufts of hairlike fibers seen on its legs confirmed this 165-million-year-old arachnid to be the oldest known species of the largest web-weaving spiders alive today — the golden orb-weavers, or Nephila, which are big enough to catch birds and bats, and use silk that shines like gold in the sunlight. The fossil was about as large as its modern relatives, with a body one inch (2.5 centimeters) wide and legs that reach up to 2.5 inches (6.3 cm) long. Golden orb-weavers nowadays are mainly tropical creatures, so the ancient environment of Nephila jurassica probably was similarly lush. "It would have lived, like today's Nephila, in its orb web of golden silk in a clearing in a forest, or more likely at the edge of a forest close to the lake," researcher Paul Selden, director of the Paleontological Institute at the University of Kansas, told LiveScience. "There would have been volcanoes nearby producing the ash that forms the lake sediment it is entombed within." "There were many large or medium-sized flying insects around at that time on which it would have fed indiscriminately," Selden said. In modern golden orb-weaver species, females are typically much larger than males. This new fossil was a female, suggesting this trend stretches back at least as far as the Middle Jurassic, Selden said — that is, back before the first known bird, Archaeopteryx, or giant dinosaurs such as Brachiosaurus and Diplodocus. 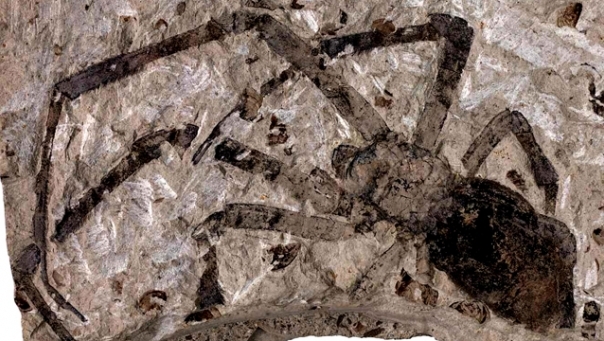 Although this is the largest fossil spider known to date, it is not the oldest. Two species from Coseley, England, Eocteniza silvicola and Protocteniza britannica, both come from about 310 million years ago. Selden and his colleagues are now investigating other fossil spiders from China, "as well as those from elsewhere in the world — currently Brazil, New Zealand, Australia, Italy and Korea," he said. The scientists detail their findings online April 20 in the journal Biology Letters. Unbelievable video recording has emerged of what a group of Russians claim is the remains of a mangled alien. The lifeless 'body" was allegedly discovered lying in snow in the Irkutsk region of southern Siberia, following reports of a UFO crash last month. The "extra-terrestrial" appears to have suffered horrific injuries -- including the loss of one limb. Shocked villagers had told of seeing a pink and blue glowing object hurtling towards the town before the alien was found. The weird reports were taken so seriously, they were investigated by the country's Emergencies Ministry staff. The mystery deepened when investigators said no aircraft were reported in the area. And search and rescue teams found no evidence of an aircraft crash. The strange clip of the discovery has now been seen by nearly 1.5 million people in the two days since it was uploaded on April 17. And cynical YouTube viewers claim it is an elaborate fake. One blogger said: "This has got to be a hoax. Why do all aliens have to be naked?" "FAIL. Sorry...so fake," another wrote. But the same writer was quick to qualify her comments. "Do aliens exist? Certainly ... Ibelieve they do. But not in this video." Powerful storms that have ripped across the Southeast killed more than 40 people over the past three days, according to the National Weather Service and reports from several states. 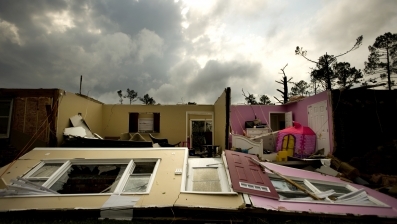 Among the worst-hit places was Bertie County, North Carolina, a rural area in the northeast part of the state. The weather service reported 14 deaths in the county. Zee Lamb, county manager, said there were 11 fatalities. More than 50 people were taken to hospitals in Greenville, and between 50 and 70 homes were destroyed, Lamb said. "Reports are still incoming," Mike Sprayberry, deputy director of the North Carolina Division of Emergency Management, said Sunday morning. The death toll across six states includes another nine in other parts of North Carolina; four in Virginia; seven in Alabama, two in Oklahoma, seven in Arkansas and one in Mississippi. For North Carolina, "When the storm count is finalized, this will likely be an historic tornado outbreak," said CNN meteorologist Jacqui Jeras. "It is quite unusual to have this many supercell tornadoes of this intensity strike the area." North Carolina normally gets about 19 tornadoes a year, according to the National Climatic Data Center. There are 90 preliminary reports of tornadoes in the state in the latest storm system. A single tornado often gets multiple reports, so it is not immediately clear how many there were, Jeras explained. "But regardless, this is an epic event." In South Carolina, a tornado cut through Berkeley County, destroying a church and injuring six people, the weather service said. In Virginia, three Gloucester County residents died and 64 suffered injuries from the fast-moving storms Saturday, according to Bob Spieldenner, director of public affairs for the Virginia Department of Emergency Management. A tornado also ripped the roof off a school in the county, felled trees that blocked multiple roads and severed power lines, leaving 9,300 people without electricity, according to Spieldenner. The storms were the latest in a round of severe weather that has hit parts of the Midwest and South since Thursday. They left a trail of downed trees and power lines, scattered cars and crushed homes as it moved east and then turned north. A suspected suicide bomber has attacked a mosque in Indonesia, killing himself and wounding 28 people. Most of the injured are police officers, as the attack happened during Friday prayers at a mosque in a police compound in Cirebon, West Java. It is the first suspected suicide attack in the country in two years but follows a recent spate of letter bombs. A majority of Indonesians are Muslims but the state is secular. Witnesses said the man was sitting among worshippers when he set off the explosives. "He was praying. From the third row, suddenly there was a blast. I was at the last row," one witness named Anton was quoted as saying by Detik news website. "We suspect it was a suicide bombing," Indonesian police spokesman Anton Bachrul Alam said. "The police have been the most active in fighting terrorism and that is why they are furious with us," he added. The BBC's Alice Budisatrijo in Jakarta says several high profile militants suspected of involvement in past bombings in Indonesia have recently been arrested or killed by the police. "It looks like there has been a shift in the extremists' target, from Western to state symbols," Noor Huda, a security analyst, told the BBC. "It's their revenge for what they see as injustice committed against them by the police and other authorities." In December, one of Indonesia's most-wanted Islamic militant suspects, Abu Tholut, was arrested on suspicion of helping to set up a militant training camp in Aceh province, recruiting militants and raising funds for "terror activities". The highest-profile arrest has been that of cleric Abu Bakar Ba'asyir, seen by many as the spiritual leader of many of Indonesia's radical groups. He is currently on trial in Jakarta. In recent years, Indonesia has introduced a combination of new laws, anti-terror training, International co-operation and reintegration measures to tackle militancy. The facial reconstruction was achieved by laser-scanning her skull to create a 3D digital model. Eyes were then digitally created, along with hair and a bonnet, to complete the look. The project was part of a £150,000 investment at York's Jorvik Viking Centre. The Dundee academics were brought in by the centre's owners, the York Archaeological Trust, as part of a project to bring York's Vikings to life. 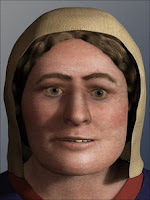 The female skeleton used was one of four excavated at Coppergate in York. The reconstruction process was carried out using specialist computer equipment which allowed the user to "feel" what they were modelling on screen. The anatomy of the face was modelled in "virtual clay" from the deep muscles to the surface. Dundee University researcher Janice Aitken took the digital reconstruction and added the finishing touches. She explained: "I use the same sort of software as is used to create 3D animations in the film industry. I digitally created realistic eyes, hair and bonnet and added lighting to create a natural look. "It is very satisfying knowing that the work we create at Dundee University will be seen by thousands of visitors to Jorvik and being part of a process which can so vividly help people to identify with their ancestors." The reconstruction now features in York Archaeological Trust's new Investigate Coppergate exhibition, which examines the Vikings' diet and investigates the diseases from which the Vikings suffered. The exhibition also looks at the final battles of the Viking age in York that heralded the end of the Viking era and the coming of the Normans. It features skeletal remains showing battle wounds and a full skeleton with evidence of severe trauma, alongside discussion about how they died. China has overtaken Spain on the list of the world's top tourism destinations, becoming the 3rd largest attraction, a senior tourism official said at the weekend. Man Hongwei, director of the international coordination department at the China National Tourism Administration, said at a press conference that the number of international arrivals staying at least one night reached 55.66 million last year, up 9.4% on 2009. China's appearance in the top three was its first. It follows France, which had 78.95 million arrivals, and the United States, which had 60.88 million, according to the United Nations World Tourism Organization. The spending by outbound Chinese tourists ranked fourth-largest worldwide last year. The number of outbound travelers hit 57.39 million in 2010, which was up 20.4% year-on-year. The industry's total revenue maintained an annual average growth of 15% during the past five years, he said. 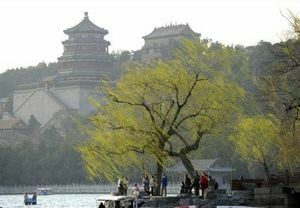 So now what are you waiting for tourists, visit China and other amazing tourist spots worldwide. Book worldwide vacation rentals. 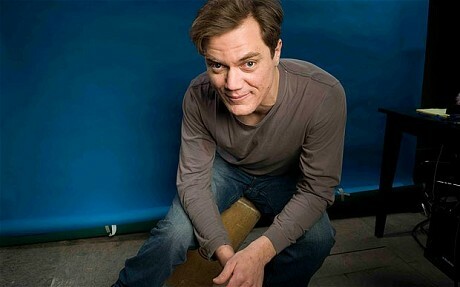 Michael Shannon, who received an Oscar nomination for his supporting role as a mentally troubled man in "Revolutionary Road" two years ago, has been cast as the villain in the upcoming Superman film. He will play General Zod opposite Henry Cavill's Superman in "Superman: Man of Steel." Zod, like Superman, is from Krypton, where he commanded its armed forces. The character appeared in both 1978's Superman and its 1980 sequel Superman II, where he was played by Terence Stamp. "Zod is not only one of Superman's most formidable enemies, but one of the most significant because he has insights into Superman that others don't," said Zach Snyder, the director of the new film. "Michael is a powerful actor who can project both the intelligence and the malice of the character, making him perfect for the role." Shannon, seen more recently as a stern federal agent in HBO's "Boardwalk Empire," joins a lineup that also includes Amy Adams as Lois Lane, and Diane Lane and Kevin Costner as Martha and Jonathan Kent, the adoptive parents of Superman's alter ego Clark Kent. 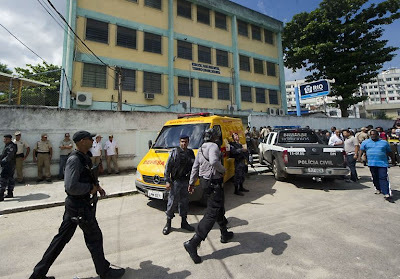 On Thursday, a disturbed young Brazilian man on a suicide mission shot dead 10 girls and two boys at his former elementary school in Rio de Janeiro. Wellington Menezes de Oliveira, 24, also shot and wounded 12 others -- many in the head -- and only stopped firing when he was shot in the leg by a police officer and turned one of his revolvers on himself, officials said. The death toll was raised late Thursday as a 13-year-old boy had succumbed to his injuries, health officials told local media. A rambling, religiously themed suicide note was found in his clothes but it shed little light on the motivation of his macabre attack on defenseless young children, aged between 9 and 15, as they arrived for morning class. Officials said police officers patrolling nearby had averted an even greater massacre at the school, which caters for some 400 pupils. "If the police had not arrived so quickly the tragedy would have been much worse, because the man had a lot of ammunition and was carrying two handguns," military police spokesman Djalma Beltrame said. "An officer who arrived at the school injured him in an exchange of gunfire, but the man killed himself with a shot to the head." Menezes de Oliveira's parents said their adopted son had left home eight months previously. A bizarre letter found on his dead body showed the killer's clearly disturbed mindset and confirmed he had embarked on a premeditated suicide mission. "They must know that the impure cannot touch me without gloves, only the chaste or those who lost their chastity after marriage and were not involved in adultery will be able to touch me without gloves," it said. "Nothing that is impure can touch my blood," the letter continued, leaving instructions for his body to be undressed, cleaned and then wrapped in a white shroud he took with him to the school. The note, which he signed, also expressed his desire to be buried next to his adopted mother and asked that "his tomb be visited by a loyal follower of God to pray before my burial asking God forgiveness for what I have done." His victims had no time to leave a note to their loved-ones. Rio state health minister Sergio Cortes told national broadcaster Agencia Brasil those killed were nine girls and one boy. The protective ozone layer in the Arctic that keeps out the sun's most damaging rays — ultraviolet radiation — has thinned about 40 percent this winter, a record drop, the U.N. weather agency said Tuesday. The Arctic's damaged stratospheric ozone layer isn't the best known "ozone hole" — that would be Antarctica's, which forms when sunlight returns in spring there each year. 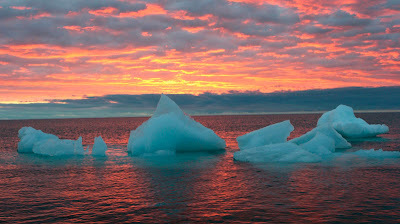 But the Arctic's situation is due to similar causes: ozone-munching compounds in air pollutants that are chemically triggered by a combination of extremely cold temperatures and sunlight. U.N. officials say the latest losses — unprecedented, but not entirely unexpected — were detected in satellite observations and weather balloons that show at what altitudes the ozone loss is occurring. 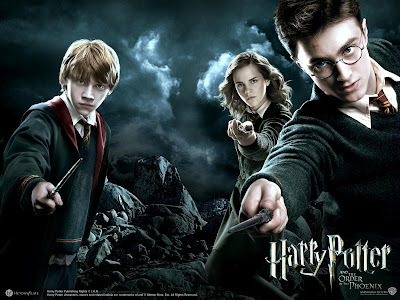 J.K. Rowling stimulated a publishing phenomenon with her Harry Potter books. Can she do it again on the e-book market? The best-selling author is considering making the fantasy books available electronically, her London-based agent said Monday - meaning that Potter fans may soon be able to download the popular series about a boy wizard to their Kindle or iPad. "We are currently actively looking at all the various options for Harry Potter in this space, that is e-books," Neil Blair, of the Christopher Little Literary Agency, said in an email. Rowling has so far stayed away from the e-book market, frustrating parts of her fan-base that have converted to the new format. Around 450 million printed copies of the wizard series have been sold worldwide, but fans say those 800 pages long are too heavy. Hence, publishing them in the electronic format will solve that problem. Rowling has been watching the developing market and waiting for the right moment to release her books in that format, Blair said. The Easter bunny has hopped into the top spot at the weekend box office. Russell Brand's family comedy "Hop" debuted at No. 1 with $38.1 million, according to studio estimates Sunday. 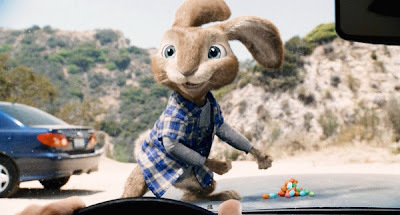 With Brand providing the voice of the reluctant new Easter bunny, "Hop" bound well beyond the expectations of industry analysts, who had figured the movie would debut in the $25 million range. Released by Universal, "Hop" matched the year's best debut, for "Rango," which opened a month ago with $38.1 million. Jake Gyllenhaal's action thriller "Source Code" debuted at No. 2 with $15.1 million. The haunted-house tale "Insidious" opened at No. 3 with $13.5 million. A Summit Entertainment release, "Source Code" stars Gyllenhaal as an Army officer tracking down a terrorist bomber by entering the mind of a man aboard a train that's about to be blown up. "Insidious," released by Film District, features Patrick Wilson and Rose Byrne as a couple with three young children who encounter an eerie force after moving into a new house. The previous weekend's top movie, "Diary of a Wimpy Kid: Rodrick Rules," fell to No. 4 with $10.2 million, raising its total to $38.4 million. While "Hop" was among the year's best openings, it was unable to lift Hollywood out of a box-office slide that has persisted since late last year. Overall revenues came in at $125 million, solid receipts for this time of year. Yet that was down 30 percent from the same weekend last year, when "Clash of the Titans" had a summer-style blockbuster opening of $61.2 million, according to box-office tracker Hollywood.com. Revenues so far this year are at $2.3 billion, off 20 percent from 2010, which had an unusual string of hits during a typically slow season for movie theaters. Despite a slow market, "Hop" might be able to leg it out for a while at theaters, with Easter still three weeks away. A combination of live-action and computer animation, the movie has Brand's runaway bunny finding refuge with a grown-up slacker (James Marsden).